You will earn 9,816 Reward Points. Earn 1 reward point for every 1 dollar spent. All the standard features as the Model 10A, plus a 6.5 kW built-in booster heater. The Model 10AB must be connected to a 140° F minimum potable water source to guarantee proper sanitizing rinse. The booster heater is sized to raise incoming water 40° F to 50° F and is thermostatically controlled to maintain proper sanitizing temperature. All the standard features as the Model 10AB, plus a 1/2 hp pump to ensure proper flow pressure during the rinse cycle. 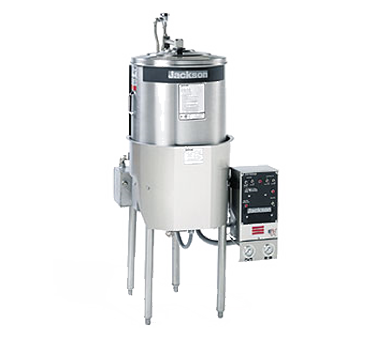 The Model 10APRB must be connected to a 140° F minimum potable water source to guarantee proper sanitizing rinse. The Model 10APRB is designed for areas of low and/or fluctuating water pressure and is highly recommended for facilities on well water systems and anywhere flow pressure is below 15 psi. The jackson 10AB dishwasher had been in our restaurant many years prior to our buying the restaurant in 2001. We replaced it with the same make and model because: The unit fit the area without need to replumb/rewire. Our primary food vendor and the rep for the soap used in the 10ab, said it is one of if not the best dishwasher built.